This year, Pacific Northwest Ballet (PNB) closes its season with ‘Love & Ballet’, four pieces by Christopher Wheeldon, Benjamin Millepied and Justin Peck that are perfect tributes to love and ballet that we Seattle audiences love. The first creation by choreographer Christopher Wheeldon for PNB, ‘Tide Harmonic’ perfectly captures and demonstrates PNB dancers’ versatile dancing styles, and on opening night made the McCaw Hall stage an ocean that is simultaneously raged by storm and calmed by the coming of the dawn. Four couples transform into the rising and falling of the tide, as their arms twirl above their heads, their bodies sway along with the movement of the wave, and their legs slash through the air. 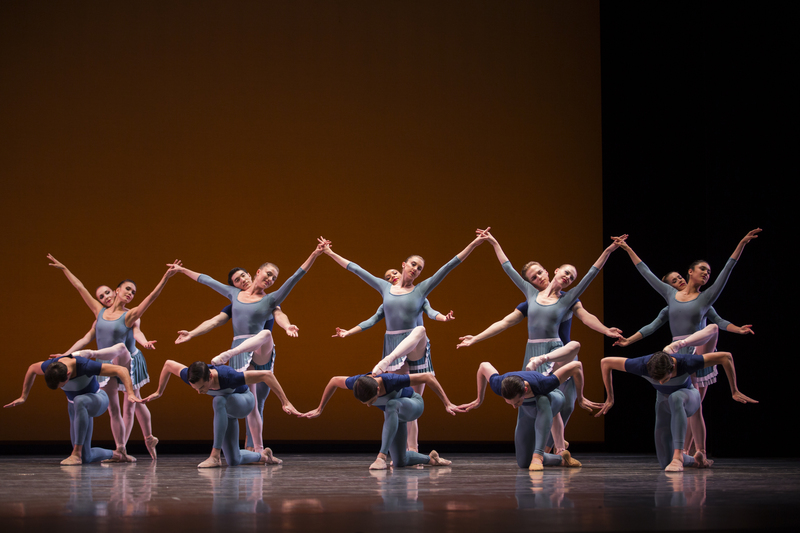 The score of the same name of the piece by British composer Joby Talbot and Wheeldon’s movement creation together capture the essence of an ocean, or more specifically water. On opening night, corps de ballet member Elle Macy again catches our eyes with her respective sharp and gentle movements that mirror the menacing storm and the lapping of the tide. A pas de deux by Wheeldon in which the ballerina dresses in a pink leotard and her partner is bare-chested, ‘After the Rain pas de deux’ is often considered as one of the most iconic pas de deuxes, and strips ballet to its core. Barefooted and without any fancy set, ‘After the Rain’ is danced only to the playing of a piano and a violin. Gentle and soothing, the music follows the couple on stage, and takes us all to the most basics of their relationship, and perhaps ours. A pas de deux of the couple moving along with each other, coming together again and again, and gently testing each other’s limit is danced by principal dancers James Moore and Rachel Foster on opening night. The first ballet after his injury that took him out of Swan Lake in February, Moore steps right back into this role, and takes our breaths away with his quiet movements. Foster, his longtime partner in this ballet, also makes us hold our breaths as they follow and challenge each other. Situated right after ‘Tide Harmonic’, ‘After the Rain pas de deux’ feels very much like a gentle but electric breeze that makes us sigh and remember the beauty of love. ‘Appassionata’ by Millepied makes it return with only three couples on stage. Danced to the Sonata No. 23 in F minor by Beethoven, ‘Appassionata’ is a colorful whirlwind that has the power to pull us right out of our seats. The energy of the sonata is wonderfully presented by the pianist, Allan Dameron, and the three couples follow suit on the many jumps and turns that make up this whirlwind. A dance marathon, this ballet easily conveys the passionate stages of romances that usually catch us off guard and just sweep us off our feet. But as the beautiful pas de deux of principal dancers Karel Cruz and Elizabeth Murphy begins, the whirlwind feel of the ballet subsides, and it instead takes us to a much more intimate place where only these two lovers dwell. Set to the score by Sufjan Stevens, and choreographed by Justin Peck, ‘Year of the Rabbit’ takes on the feel of summer, and acts as the perfect ending piece that leaves us upbeat and positive. The curtain rises with gasps from audiences on opening night. A layered ballet, Year of the Rabbit centers around two couples and two individual dancers, but the corps de ballet is certainly a show of its own. The backdrop as well as the set that keeps the ballet going, the corps de ballet is like the onlookers or the crowd that is swarming beside the two couples. For the couples and individuals, Peck also created complex but musical movements that mirror the tempo and feel of the score. Soloist Angelica Generosa begins the ballet with a sense of confident ease, and soloist Matthew Renko too captures the spirit of this piece, but what balances the confident energy of this piece is the Year of the Lord pas de deux between principal dancers Noelani Pantastico and Jerome Tisserand. Their pas de deux adds a certain vulnerability to the whole piece, and is a candy to the eye with Tisserand’s confident but gentle movements, his effortless jumps and Pantastico’s musicality and her wonderful technique. ‘Love & Ballet’ will close on June 10, and following that night is PNB’s annual Encore performance. This year, the company is bidding farewell to its beloved principal dancer Karel Cruz, and will showcase many excerpts from this season.